When you hear about games set in the WWII Nazi era, you likely think of FPS franchises such as Call of Duty or Brothers in Arms. At the same time, it’s quite likely that you’re also tired of WWII related games and could do without another one for a good while. So what better time for EA and Pandemic to release their recent WWII based title called The Saboteur. There is a difference though. The Saboteur is a unique and refreshing WWII based game. The best way to describe this game is to think of a mix between GTA IV, Assassin’s Creed and Splinter Cell. There are elements of these aforementioned games that exist in The Saboteur and for the most part work well together to provide quite an entertaining experience. 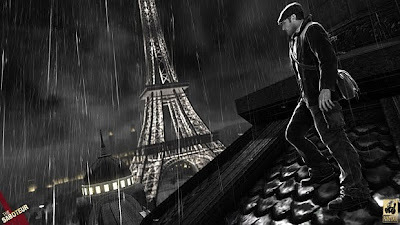 You play as Sean Devlin, a hardnosed and mouthy Irishman who’s been living in Paris for some time. Life for Sean moves along peacefully until a run in with the Nazis turns tragic for a close family friend. To add to this, the Nazis begin their invasion of France and take occupation of Paris. It’s here that Sean, with the help of some friends and Resistance rebels fight back against the Nazi occupation in an attempt to free and reclaim Paris from their oppressors. The immediate thing you notice about this game are the visuals. The game begins primarily in a film noir tone where mostly everything is in shades of black and white. To give the game artistic flare, there are some colour accents thrown in and as a result, provides a very effective contrast to the game’s palette. Beyond form, this colour scheme does serve a functional purpose in that it denotes Paris’ oppressed attitude towards Nazi occupation. As you progress through the game and take back more of Paris from the Nazi regime, these areas will switch from black and white to complete colour. This colour transformation means that the residents in these areas are more resistant to the Gestapo and will provide you with more support in your battle. Game controls and mechanics are quite solid. Controls are straight forward, easy to learn and they respond well during gameplay. Climbing and sneaking are key elements for gameplay and are necessary to effectively progress through the game. For the most part, the climbing and sneaking mechanics are good, but at the same time they’re not without faults. Climbing can feel uncoordinated and rigid at times while sneaking can be more of a challenge because the detection/alarm meter is not always consistent when attempting a sneak attack on an enemy. There is a great variety of weapons and vehicles to be collected and made available at your disposal. Weapon and vehicle controls are tight and fairly easy to master. You can also collect contraband to be used for acquiring new weapons, upgrades and replenishing ammo. There are also key tasks to perform that will allow you to obtain perks. Perks will unlock special abilities or attributes for Sean that becomes very useful within the game. All in all, The Saboteur is a solid and highly fun game that brings new flavour to the WWII genre. The game’s production is strong with great visuals, an entertaining soundtrack and competent voice acting – it’s especially rewarding to listen to Sean in all his Irish glory. In my opinion, this is game that will provide decent entertainment for a good handful of hours and is worth a spin around the ol' block. I like the idea behind it, but I'm a little disappointed that there was no co-op or anything like that. I get that it's a SP game, but it seemed like co-op would have been easy enough to add in. Hope you guys can do a review!